Financial Analysis of Energy Transfer Partners (NYSE: ETP) Securities and Exchange Commission Filings this past July by the Mockingbird showed that ETP did not have the operating cash on hand to complete the Dakota Access Pipeline. This may not have been a great concern to them as the $3.8 billion project was initially slated to take 3 years and it was presumed they would pay as the went. Delays related to Native Resistance have changed the time line and increased the cost. ETP has found way to turn these delays to profit with the help of a coalition of Clinton Foundation Connected Wall Street Firms. On August 2nd ETP announced that it was putting $1.5 billion worth of stock on the market. This move would increase their market capitalization by over 8% while diluting their share value. They selected a group of 20 banks and investment firms to be resellers of their stock. These firms were Credit Suisse Securities (USA) LLC, Banca IMI Securities Corp., Barclays Capital Inc., BNP Paribas Securities Corp., Citigroup Global Markets Inc., Deutsche Bank Securities Inc., Goldman, Sachs & Co., Jefferies LLC, J.P. Morgan Securities LLC, Merrill Lynch, Pierce, Fenner & Smith Incorporated, Mizuho Securities USA Inc., Morgan Stanley & Co. LLC, MUFG Securities Americas Inc., Natixis Securities Americas LLC, RBC Capital Markets, LLC, SunTrust Robinson Humphrey, Inc., TD Securities (USA) LLC, UBS Securities LLC, USCA Securities LLC and Wells Fargo Securities, LLC. This impressive array of Wall Street heavyweights made a killing. They purchased the ETP stock on August 2nd at $35.6 per share. The very next day the value was 42.7 per share. It is not clear how many shares were sold off immediately as was intended or retained as was permitted but it is likely that 100% were sold. Thus these 20 firms made a tidy profit of $299.1 million or about $15 million each on average. This is not a bad day's work even for a bank. Thus in two days, ETP netted $1.5 billion in cash for the Dakota Access pipeline project and the banks profited by $300 million. Investors buying from the banks lost out to the tune of $429 million as a month later the stock was valued at $32 a share. Big banks who are Clinton donors can turn a nice profit from big oil blood money but Grandma's retirement savings get the shaft. At ETP's average divident rate it would take an investor seven years to recap that single day's loss. Last week the Clinton Campaign supported ETP's Dakota Access Pipeline project by calling on non-violent protestors to come to the table after being beaten, gassed and locked in dog kennels for their opposition to what her campaign refers to as a “federal infrastructure project” despite it's private ownership. Support for the human rights abuses has come from at least two federal agencies, FEMA and the FAA. This campaign support can be seen as a quid pro quo to the investing banks. Of the 20 banks that made a profit on the stock deal, fourteen (Credit Suisse, Barclays, BNP Paribas, Citigroup, Deutsche Bank, Goldman Sachs, Jefferies, J.P. Morgan, Merrill Lynch, Morgan Stanley, RBC Capital Markets, TD Securities, UBS Securities, and Wells Fargo Securities have made huge donations to the Clinton Foundation. The donations were not simply a matter philanthropic cash disbursements as tax write offs. 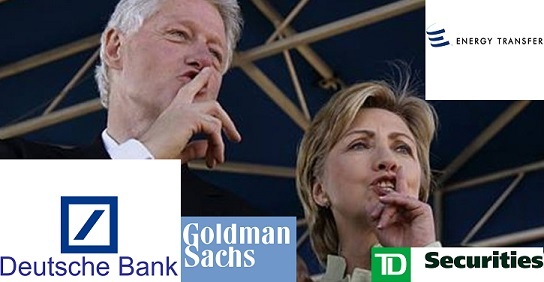 Credit Suisse, Citigroup, Deutsche Bank, Goldman Sachs, and J.P. Morgan were amongst the Wall Street firms forking over Hillary Clinton's $250,000 an hour speaking fees. Another two, Jefferies and BNP Paribas paid for Bill Clinton to speak while TD Securities lavished the former President with a $1.3 million trip to Africa. Bill Clinton's gold plated jaunt was in support of a joint program by TD Securities and the Banro corporation with the Clinton Global Initiative's health care program in the Congo. One might wonder how many children could have been vaccinated and thus not died from preventable disease with that money if the former President had simply shut up and stayed home. The connections between the Clinton Global Initiative and these banks does not end with TD Securities. With the exception of Jefferies, ever single one of the 14 donors to the Clinton Foundation has some level of ongoing partnership with the Clinton Global Initiative. One bank, UBS Securities even has a leadership connection. Erika Karp, a former managing director at UBS until forming her own investment firm, is a key adviser to the Market Based Strategies track at CGI. Before working at UBS Karp was a director at Credit Suisse, thus showing that the doors of power constantly revolve. It is clear from the federal support, as well as assistance in repression from State and County level governments, that the completion of the Dakota Access Pipeline is a major priority for the establishment. Support from the current Obama administration will likely be ratcheted up in the incoming second Clinton Administration. The banks and energy companies have already bought Hillary Clinton's support for this project. The Editor in Chief of The Outsider, Shawn Gaynor, contributed research to this article.